Objective: Use jacks safely for equipment repairs. Review the information below on hazards and safe practices with jacks. Emphasize the importance of not working alone when using jacks. Demonstrate the correct way to use a jack when working on equipment. Supervise teams of workers carefully while they practice safe methods for using a jack with various pieces of equipment. The recommendations presented here are important for the safe use of jacks. Compare the rated capacity of the jack to the weight of the load to be lifted to ensure that the jack can safely do the job. Keep jacks lubricated as recommended. Do not use a jack that is leaking fluid. Handle jacks carefully. Dropping or throwing them may distort or crack the metal, and the jack may fail under the load. Position the jack properly at a point that can support the lifted weight. The lift point should be flat and level with the floor or the ground. The floor or ground must be able to support the base of the jack. Lift should be straight up and down. If working on the ground outdoors, place a long, wide block under the base of the jack to keep it from sinking, shifting, or tipping when weight is applied. If the jack will not lift high enough, place additional blocking under the jack. Never put extenders for height between the jack engagement and the load. Don’t let this happen! Reset the jack if it starts to lean and block the equipment more securely. Stabilize the equipment. If the machine is self-propelled, place the transmission in gear or in the park position. Then set the brakes and switch the ignition off. Block at least one of the wheels remaining on the ground. Be certain to loosen the wheel’s nuts before the wheel is lifted off the ground. This will prevent any possible movement that could dislodge the tractor off the jack. 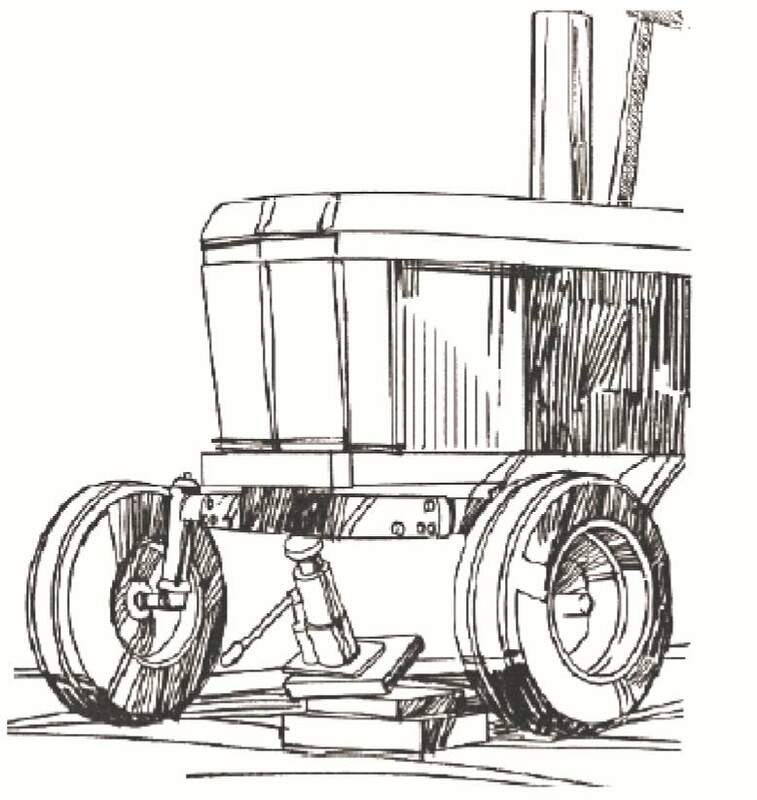 When lifting pull-type equipment, hitch it to a tractor drawbar to keep it in place. Always check the position of the jack after it has started to lift. If it leans, lower the jack and reset. Lift no higher than is necessary. Beware of the jack handle. Some mechanically operated jacks can pop up and kick when the load is lifted or lowered. Stand to one side while jacking equipment to avoid being struck by the handle. Never straddle a jack handle and always remove the handle when it is not being used. Support the load that is being jacked with blocks or stands. Never allow raised equipment to remain supported by jacks alone. Jacks can fail and tip, causing the equipment to fall unexpectedly. Place solid blocks or stands under the equipment immediately. Do not use cement or cinder blocks because they may shatter under the load. Stabilize the equipment, then set the brakes and block the wheels. Do not overload the jack. Check allowable load ratings. Lubricate with recommended oil as directed. Do not drop the jack. Position the jack properly and stop lifting if the load shifts. Avoid jacking more than one wheel off the ground at a time when working in the field. If working on the ground outdoors, place a heavy block under the base of the jack. Recheck the jack before completing the lift. Remove the jack handle when the lift is completed. Lift only as high as necessary. Support the lifted load with blocks or a stand. Never position any part of your body underneath a jack-raised vehicle. Check the jack rating before use to ensure that it can carry the load. Do not use leaking jacks. Stand to the side while jacking to avoid being struck by the handle. Support the load with blocks or stands. Cement or cinder blocks should not be used because they may shatter under the load.